While their story is almost always overlooked, the 1.5 million Indian soldiers who served the British Empire in World War I played a crucial role in the eventual Allied victory. Despite their sacrifices, Indian troops received mixed reactions from their allies and their enemies alike-some were treated as liberating heroes, some as mercenaries and conquerors themselves, and all as racial inferiors and a threat to white supremacy. Yet even as they fought as imperial troops under the British flag, their broadened horizons fired in them new hopes of racial equality and freedom on the path to Indian independence. Drawing on freshly uncovered interviews with members of the Indian Army in Iraq and elsewhere, historian George Morton-Jack paints a deeply human story of courage, colonization, and racism, and finally gives these men their rightful place in history. George Morton-Jack studied at Oxford University and currently works as a lawyer in London. The author of The Indian Army on the Western Front, he lives in Bristol, UK. "Revelatory... fluent and colourful... This book describes the war as a worldwide conflict involving a million Indian soldiers [and] shows how crucial they were to Allied success." "Absorbing [and] welcome... explores a remarkably diverse fighting force 1.5 million men of all castes and creeds... This book is a fitting testament to the sacrifices they made." "An outstanding book that brings to life the experiences of Indian soldiers in all of the theatres of WWI, from German colonies in China and Africa to the Middle East and the Western Front. 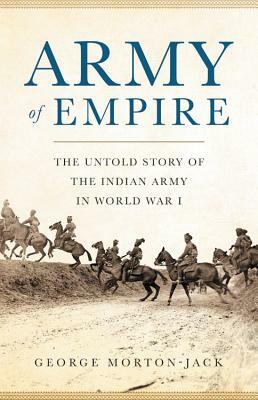 Thoroughly researched and engagingly written, George Morton-Jack restores the Indian Army to its rightful place in the history of the Great War." "The Indian Army's role in World War I is perhaps the least understood dimension of that global conflict. Although the centenary of the war sparked off some interest in the stories of these soldiers, there has been no sustained examination of their experiences. Army of Empire fills this void in our historical understanding admirably and comprehensively. Widely researched and vividly written, George Morton-Jack's account of the Indian Army's crucial contribution to the Allied victory is unlikely to be surpassed any time soon." "Fascinating....George Morton-Jack writes with the compassionate heart of a poet and the cold eye of a historian seeing the vast canvas of the ages. We owe him gratitude for bringing light to a deserving but neglected part of world history; those of us with an interest in South Asia are forever indebted to him."